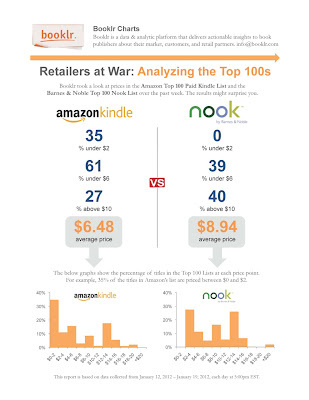 Booklr just released an interesting comparison between the prices of the top 100 sold ebooks on BN.com and Amazon. It's an interesting comparison, although it might have reached the wrong conclusion. "With the Kindle Fire, Nook, and e-readers constantly in the news, Booklr took a look at the prices in the Amazon Top 100 Kindle List and the Barnes & Noble Top 100 Nook List over the past week. The results might surprise you. The price of ebooks from each retailer is not always uniform. Consumers should consider this important factor since once you choose a device, you’re locked in to that retailer." 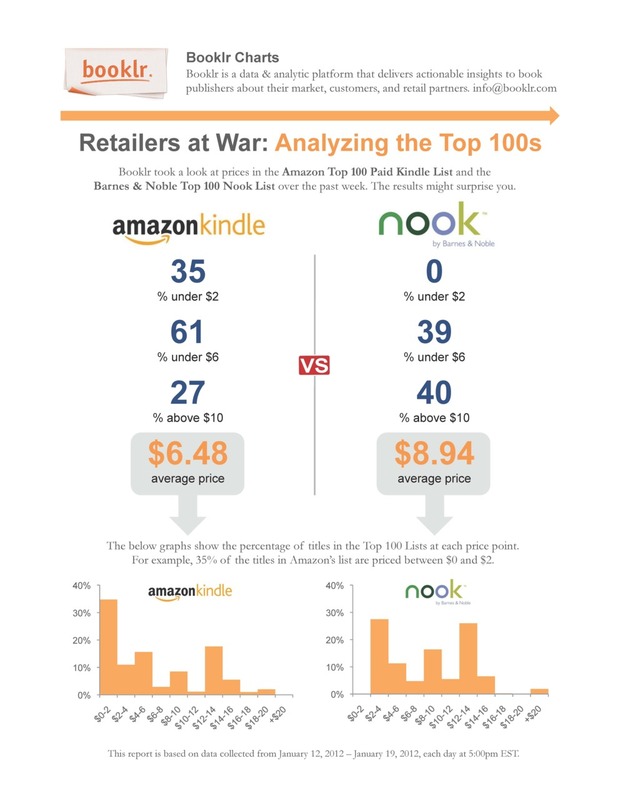 As you can see from the comparison below, the average price of a book on the top 100 list on Amazon is $6.48, while the average price of an ebook on the top 100 list on BN.com is $8.94. As you can also see from the comparison below the main reason for the difference is that cheap ebooks, with a cost between $0-2, are 35 percent of the top list on Amazon. What we can learn from this data? 1. Readers like cheap ebooks. 2. Amazon offers many cheap books. What we can't learn from this data? 1. ebooks have different prices on Amazon and BN.com - it might be the case, but you can't learn it from this compassion. 2. Amazon is cheaper than B&N - to reach this conclusion, you need to compare apples to apples (the same books), not apples and oranges.